This man has hit the nail right on the head! A liar is a liar, no matter how you look at it or who it may be! Wonder how he REALLY feels! 3) Clinton’s stain on Monica’s dress, and what that did to the White House in general and the office of the President specifically, will forever pale in comparison to the stain and stench of Obama’s reign. Richard Nixon’s words “I am not a crook,” punctuated with his involvement in Watergate; and Bill Clinton’s finger-wagging as he told one of the most pathetic lies in presidential history will be viewed as mere prevarications in the aftermath of Obama. Nixon and Clinton lied to save their backsides. Although, I would argue there are no plausible explanations for doing what they did, I could entertain arguments pursuant to understanding their rationales for lying. But in the case of Obama, he lies because he is a liar. He doesn’t only lie to cover his misdeeds – he lies to get his way. He lies to belittle others and to make himself look presentable at their expense. He lies about his faith, his associations, his mother, his father and his wife. He lies and bullies to keep his background secret. His lying is congenital and compounded by socio-psychological factors of his life. Never in my life, inside or outside of politics, have I witnessed such dishonesty in a political leader. He is the most mendacious political figure I have ever witnessed. Even by the low standards of his presidential predecessors, his narcissistic, contumacious arrogance is unequaled. Using Obama as the bar, Nero would have to be elevated to sainthood. As the stock markets were crashing, taking with them the remaining life savings of untold tens of thousands, Obama was hosting his own birthday celebration, which was an event of epicurean splendor. The shamelessness of the event was that it was not a state dinner to welcome foreign dignitaries, nor was it to honor an American accomplishment – it was to honor the Pharaoh, Barack Hussein Obama. The events sole purpose was for the Pharaoh to have his loyal subjects swill wine, indulge in gluttony and behavior unfit to take place on the property of taxpayers, as they suffer. It was of a magnitude comparable to that of Tyco CEO Dennis Kozlowski’s $2 million birthday extravaganza for its pure lack of respect for the people. The people of America own the home Obama and his wife continue to debase with their pan-ghetto behavior. It is clear that Obama and family view themselves as royalty, but they’re not. They are employees of “We the People,” who are suffering because of his failed policies. What message does this behavior send to those who today are suffering as never before? 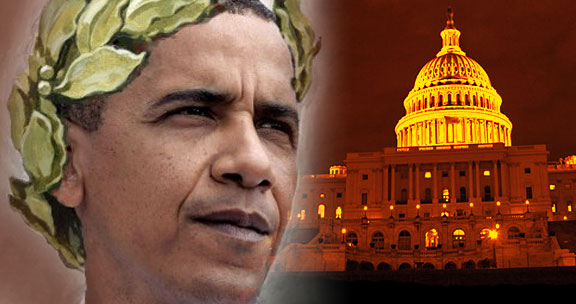 Like Nero – whose debauchery was only slightly less than Caligula – with wine on his lips Obama treated “We the People” the way Caligula treated those over whom he lorded. And you know he is not Rascist! Nice to hear from another black man.